I meant for today’s post to be a review of Post Mortem Press’ Fear the Abyss anthology. Unfortunately the review isn’t quite ready. 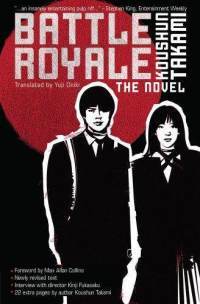 However, I’m still in the mood to talk about books, so I thought I would put together some thoughts on Koushun Takami’s Battle Royale, a book which I impulse bought while the Page of Reviews was on hiatus. As I’m fairly certain Battle Royale has been reviewed seven ways from Sunday, I’ll skip contributing to a discourse which likely already includes more than enough discussions of Orwell and Golding as seen through an Asian lens. Instead I want to explore a few narrative elements wherein Battle Royale is very atypical of my reading of Japanese popular culture as seen through anime and manga. Granted there may be some level of comparing apples to oranges within my methodology, but as a person who can’t read Japanese I do the best I can with the materials at hand. Battle Royale is the first piece of Japanese fiction I’ve read/watched wherein the government is actively portrayed as an antagonist. Set in an alternate history version of the 1990s, Japan is part of a larger empire known as the Greater Republic of East Asia – an obvious reference to Japan’s WW2 creation of the Greater East Asia Co-Prosperity Sphere. Through the eyes of a class of junior high school students, the GREA is seen as an oppressive and invasive fascist state ruled by a semi-divine “Great Dictator.” To speak out against the Dictator is to invite summary execution from the police. While elements of government are often portrayed in anime/manga as overly hawkish or even downright American – I’m thinking General Colbert of Tekkaman Blade or Admiral Takashi Hayase of Macross – government, at least human government, is rarely evil in the banal sense of the word. Only through othering in the form of extraterrestrial governments/juntas do we see shades of fascism. Therein the mostly democratic governments of Earth are legitimized, even if they do tread a slightly authoritarian line. Also unusual is Battle Royale’s construction of characters that exist without any sort of heroic justification. It’s all too common to see popular Japanese heroes as the reluctant warrior pressed into righteous combat by circumstances beyond their control. Hiraku Ichijo (Macross), Shinji Ikari (Evangelion), Susumu Kodai (Space Battleship Yamato), and Amuro Ray (Mobile Suit Gundam) all fit into the model of reticent hero. To some extent, Battle Royale’s Shuya Nanahara follows this formula. Before the battle begins, Shuya’s best friend is gunned down by their teacher. That same teacher also rapes the matron of the orphanage where Shuya grew up. But where there are characters like Shuya who fight for some worthy purpose (in theory) there is also someone like Kazuo Kiriyama, who decides to kill a group of his class mates on the flip of a coin. Far from an over the top depiction of evil, Kazuo is as cold and calculating as Patrick Bateman of Bret Easton Ellis’ American Psycho. Consider as well Shogo Kawada, a senior student accidentally recruited into the Program for a second time. Even though Kawada might best be seen within a sensei-Chiron trope, he’s a proven killer who is content to reduce victory in the Program to winning a handful of matches in a grand tournament. Another aspect of the novel which struck me as a thematic outlier is its early rejection of pacifism. A few hours into the first day of the Program, best friends Yumiko Kusaka and Yukiko Kitano stumble across a megaphone in the scenic lookout they are using as a hiding spot. Despite knowing that a number of their friends died in the first round of the Program, the two characters genuinely believe that none among their class really want to kill each other. Using the megaphone they invite their fellow students to use the lookout as a sanctuary. In doing so, the girls give away their positions and are quickly shot and killed. Thus are pacifism and idealism rejected when the threshold for survival demands human sacrifice. The only thing that even approaches a refusal of the status quo within Battle Royale is suicide. For example, Sakura Ogawa is unwilling to see any of her classmates as enemies. Without even opening her back pack to see what weapon she was assigned, she throws herself off a cliff. This is not an act of cowardice after discovering herself armed with a fork where her friends have guns and crossbows; Sakura simply refuses to play the game. For all we know Sakura had a sub-machine gun in her pack. Sakura’s boyfriend, Kazuhiko Yamamoto, joins her in death, unwilling to kill so that he might live in a world absent Sakura. Though noble, these and other suicides within the novel are a complete divergence from the “let’s all hope to live in a world of peace” motif which is a mainstay of anime and manga. Moreover, they are meaningless deaths. It’s common enough to see self-sacrifice, Full Metal Alchemist and Ghost in the Shell SAC come to mind, but solemn non-ritual suicides are few and far between. In 1997 Battle Royale was disqualified from Japan’s Grand Prix Horror Novel competition. I wonder, though, if its rejection was on account of the graphic violence, or its deviation from the norms of Japanese popular culture? 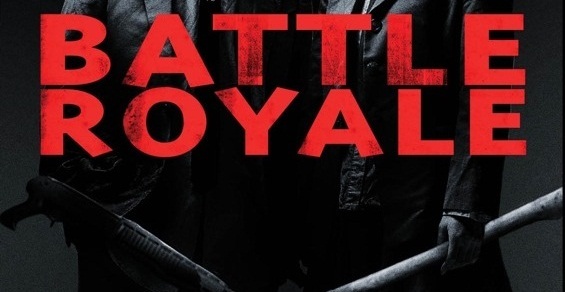 Either way, as a reader with relatively little experience with proper modern Japanese literature, Battle Royale is a fascinating demarcation from the tropes and clichés ubiquitous to anime and manga.